There are lots of good reasons to keep active when you're pregnant. Exercise improves your muscle tone, strength and endurance, which may make it easier for you to adapt to the changes that pregnancy brings. Give you the chance to meet other mums-to-be, if you opt for a class. The ideal exercise in pregnancy will get your heart pumping and keep you supple, without causing physical stress. Many activities, such as running and weight training, are fine in the beginning, but you may need to modify your workout as you grow bigger. -Aerobic exercise, which works your heart and lungs. -Muscle-strengthening exercise, which improves your strength, flexibility and posture. To get the full benefits, you'll need to exercise at least three times a week, ideally more. Try to find something that you enjoy, as you'll be more likely to stick to it in the longer term. Avoid doing sports where there's a risk of hitting your bump, or of slipping and falling, such as squash, gymnastics, rollerblading, horse riding and skiing. 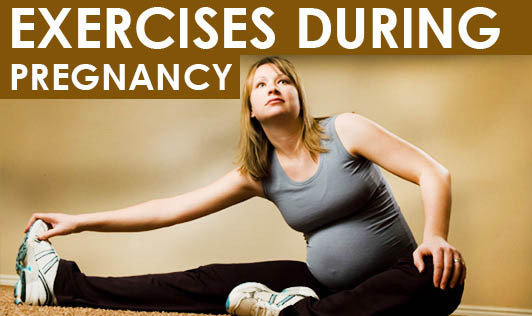 The following types of exercise are safe in pregnancy, though some may not be suitable for the last few months, and you may need to lessen the activity as your pregnancy progresses. Talk to your doctor, midwife or a physiotherapist before starting any exercise that's new to you. Brisk walking keeps you fit without jarring your knees and ankles, and gives your heart a workout. It is safe throughout pregnancy, and can be built into your daily routine. Aim to walk for at least 30 minutes a day, five times a week. So walk to the shops rather than drive, take the bus only part of the way, or do a brisk few laps of the park or pavements in your lunch hour. Stretching helps to keep you supple, though don't overdo it. Think about gently opening and extending your body, rather than pushing yourself. Your yoga teacher will show you how to relax your body and mind. Make sure that your yoga teacher is experienced in providing advice for pregnant women. It’s best to go along to a pregnancy yoga class, rather than start with a DVD. The exercises you learn may help you with relaxation and breathing in labour, too. Pilates targets the muscles that can weaken during pregnancy, in a way that supports, rather than strains, them. Choose an antenatal pilates class, if there's one in your area. If weight training is already part of your exercise routine, there’s no reason to stop now that you're pregnant. As long as you're careful, using light weights will tone and strengthen your muscles.